Chinese people enjoyed eight days long holiday, from October 1st to 8th, as its National Day (国庆节) and Mid-Autumn Festival (中秋节) fall on the same week this year. 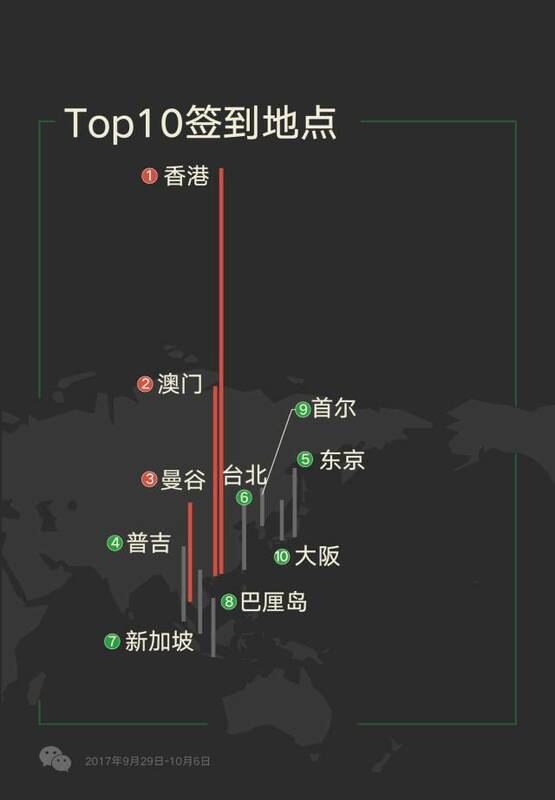 WeChat issued a National Day big data report on October 8th, announcing that Hong Kong became the top destination for outbound Chinese tourists on National Day, our sister media TechNode China is reporting. Not surprisingly, the largest number of Chinese outbound tourists were coming from first tier cities Shanghai, Beijing, Shenzhen, and Guangzhou. Second and third tier cities followed, including Hangzhou, Nanjing, and Chengdu. The fastest growing outbound travel city was Chongzuo City in Guangxi province, showing the outbound travel growth rate as high as 338%. Most of the mainland’s outbound tourists chose the closer travel destinations like Southeast Asia, East Asia (South Korea and Japan), Hong Kong, Macao and Taiwan regions. Hong Kong was the top single destination for outbound tourists, followed by Macao, Bangkok, Phuket, Tokyo, Taiwan, Singapore, Bali, Seoul, and Osaka. Southeast Asia received the most Chinese tourists followed by East Asia (South Korea and Japan), Hong Kong, Macao and Taiwan regions, North America, and Europe. 52% of outbound tourists’ expenditure was made in duty-free shops. It’s interesting to note that expenditures made in duty-free shops and drug stores exceeded 60% of the total expenditure. The largest number of people departed the country on October 1st. More than 600,000 people departed the country, far higher than other smaller holidays. Post 90s generation visited Hong Kong, US, and Japan the most, while post 80s generation visited Hong Kong, Thailand, and Japan the most. Post 70s generation visited Hong Kong, US, and Macao the most. 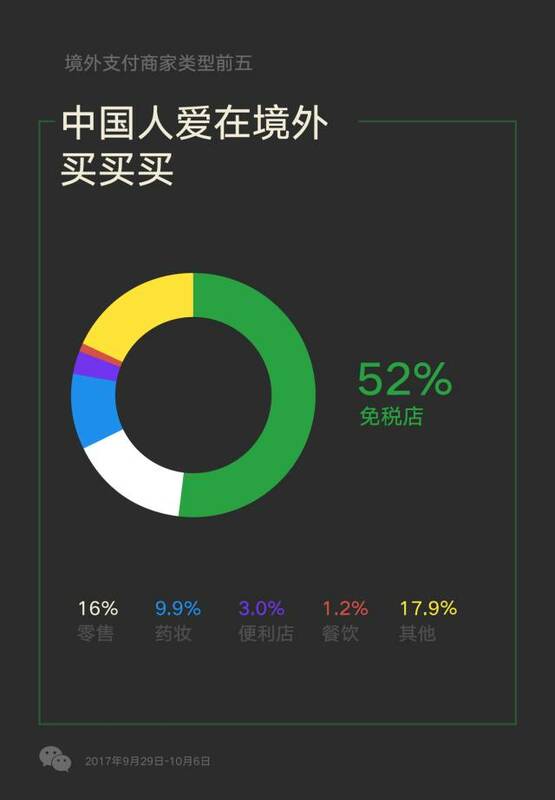 WeChat payment was used the most in Hong Kong, followed by Thailand, South Korea, Japan, Australia, and Taiwan. 6.3 billion Red packets (hongbao) were sent and received on Mid-Autumn festival. Most WeChat calls were made between post-60s generation and post-90s generation. The longest average phone call was 750 seconds when post-60s generation called 90s generation, followed by 610 seconds when post-90s generation called post-60s generation.